This is a research guide for Mary Lum's Library City: Practicing Curiosity (VA4113.01) course. This course will inhabit the library as a 21st century city of knowledge. After introductory lectures and readings about cities and libraries, students will spend the term mapping highly individual paths of research through the collections of Crossett Library. Intensive directed reading and looking, will result in the creation of written and visual essays, through which relationships will be built between a range of urban subjects. Each student’s inquiry will be iterative, and research methods idiosyncratic. The results of this research will take form in small books and zines, made regularly throughout the course, and weekly group discussions of findings. In the way that much research today contains many voices, a collaborative atlas of the Crossett Library/city will be made, in addition to the individual bodies of work. Students taking this course should be highly self-motivated, curious, have a good familiarity with image making, and be ready to read, write/make and speak weekly. A variety of on and offline research tools will be introduced, and students will be expected to use them extensively. We will meet in the library and VAPA. 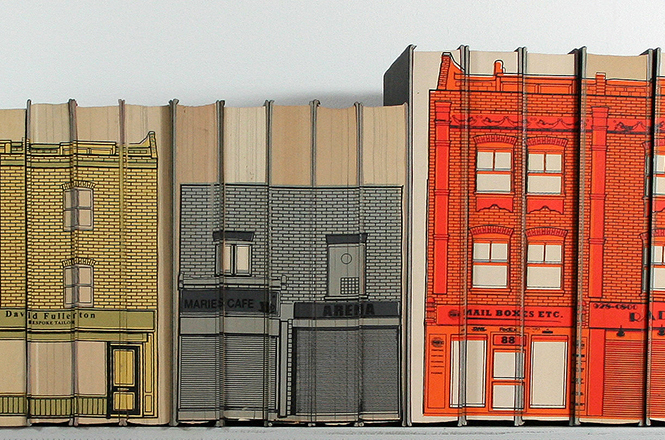 from the series BookBlock by Daniel Speight.